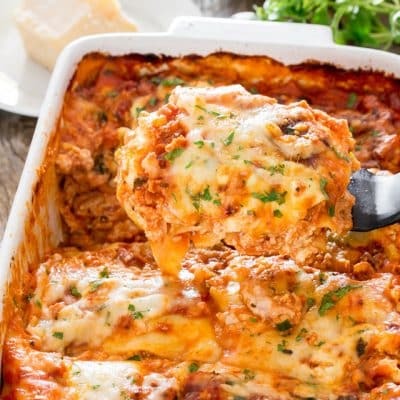 Chicken Lasagna alla Bolognese – This recipe is made with ground chicken and pancetta for the Bolognese sauce. Simple to make and a favorite comfort food. Don’t you just love lasagna? 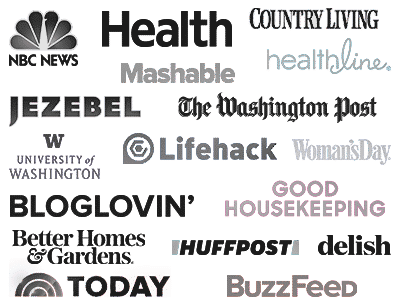 I’m sure you all have your own version of lasagna, like your go-to recipe from your mother or grandmother. Well I never got one from my mom, but I did learn to make lasagna myself a very long time ago. 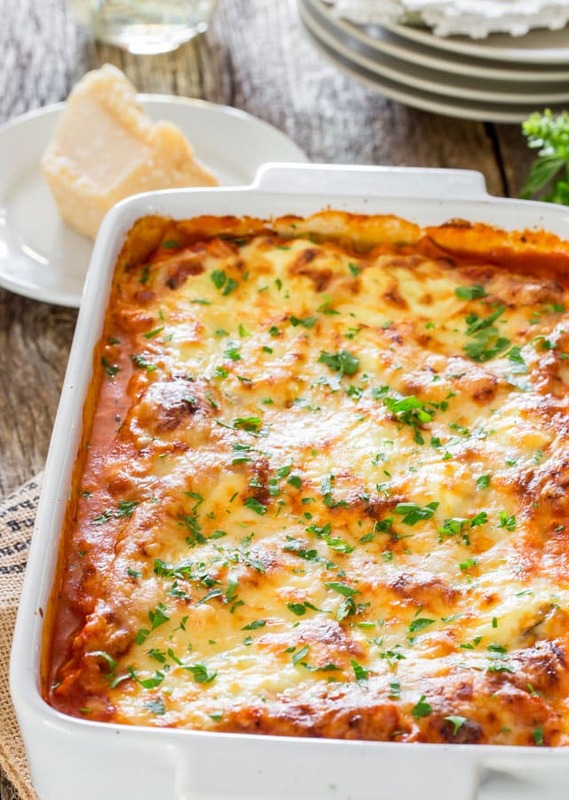 Lasagna has always been one of my favorite pasta dishes! Maybe it’s all the cheese, or all the saucy noodles, or because when you put all these great ingredients together, you’ve got a classic comfort food. There’s nothing more classic than a good lasagna alla bolognese. Bolognese sauce, which is also known as ragu, is simply an Italian meat-based sauce. That’s what I’ve done here, after all this lasagna is all about the meat sauce! While beef is traditionally used for bolognese, I decided to make it a bit healthier and use chicken. You could use ground turkey or even ground pork, it’s totally up to you. I also added some pancetta because we all know that bacon makes the world go round! Then of course, as any good meat sauce, it’s loaded with onion, celery, carrots, lots of garlic and basil. As you probably already know the secret to a good sauce is to let it simmer on low heat for a while. For the sake of speeding this recipe up a bit, I simmered it for 20 minutes and it was still delicious. The sauce is about the hardest thing about this chicken lasagna recipe, and that’s saying a lot! First you’ll heat the olive oil in a large pot over medium heat. Add the onion, carrot, celery, garlic, and pancetta, and cook until the onions soften. Now add the chicken, break it up into pieces, and cook until you can’t see any more pink. Mix in the oregano, chili flakes, tomato paste, then the wine and fresh basil. Let this cook for a few minutes so that the alcohol can burn off. 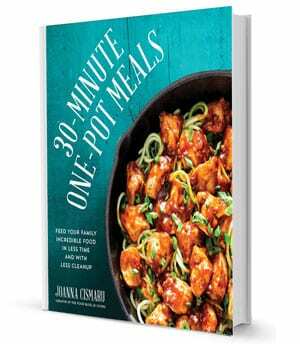 Now you can pour the chicken broth and crushed tomatoes in and let all those amazing flavors simmer for 20 minutes! I actually use uncooked lasagna noodles for this recipe. I discovered this a while ago and let me tell you- it works! This is what I used to hate about making lasagna before is that I had to boil the noodles, making me extra dirty pots to clean. No thank you. You can use dry noodles straight out of the package! They will cook up with all that delicious sauce in your lasagna. After you layer your lasagna, all that’s left to do is bake it. If you use the dry noodles it will take about an hour to cook fully. If you use the fresh ones, it will take about 40 minutes. That’s all there is to this classic lasagna. Now it’s time to eat! 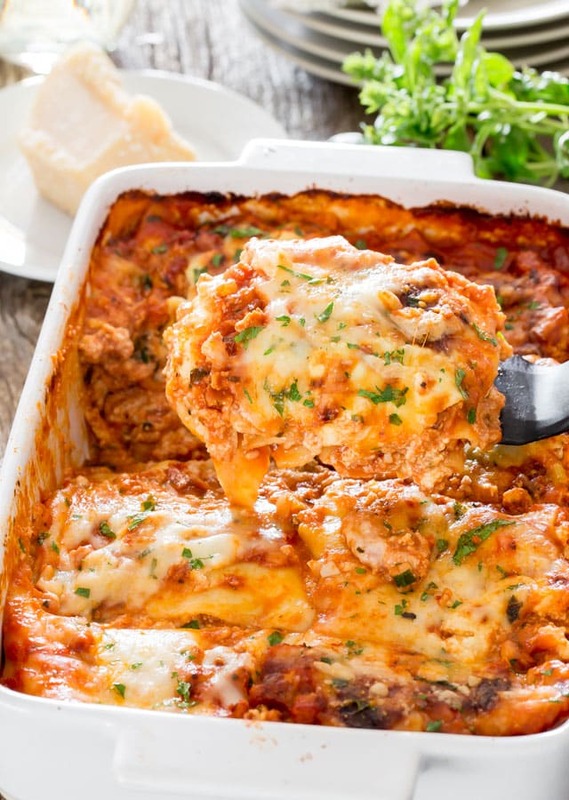 Lasagna can be a messy job, so if you have more than half of this lasagna leftover, keep it right in the baking dish. Let the lasagna cool down to room temperature, then cover the dish well with plastic wrap or foil. It will last in the fridge for 3-5 days. This is such a great dinner to make ahead of time! You can freeze it cooked or uncooked. If you cook it first, make sure it has time to cool down to room temperature completely before storing it in the freezer. Cover it tightly with foil, and pop it in the freezer. It will last in there for 2-3 months. To reheat the lasagna, preheat your oven to 400F. Keep the foil over the baking dish and cook the lasagna for 1.5 hours. Remove the foil, and bake for another 10 minutes or until the cheese begins to bubble and brown. 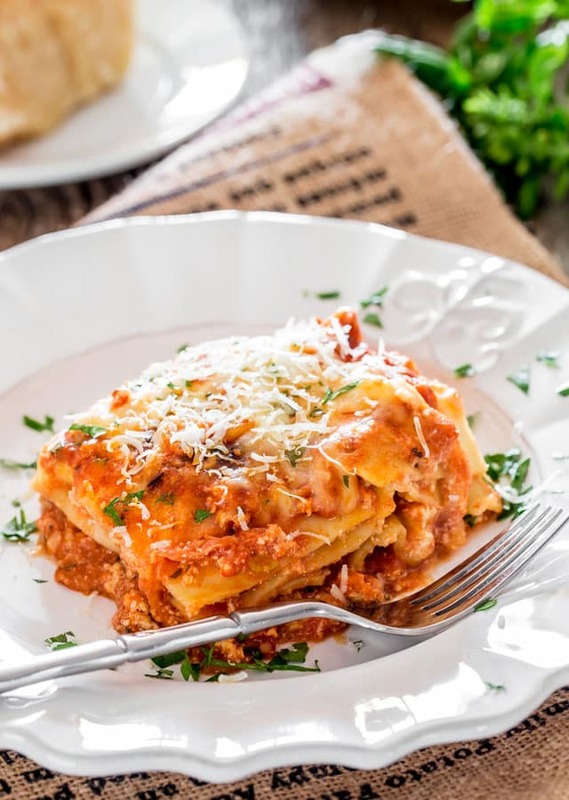 Chicken Lasagna alla Bolognese - a classic lasagna recipe using ground chicken and pancetta for the Bolognese sauce. Simple to make and a favorite comfort food. 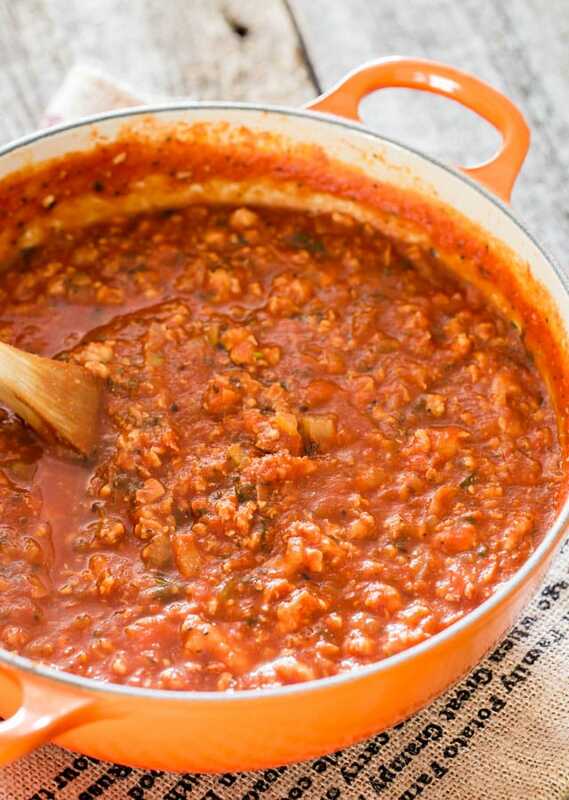 Make Bolognese Sauce: In a large pot heat the olive oil over medium high heat. Add the onion, celery, carrot, garlic and pancetta to the pot and saute for about 5 minutes until onion is soft and translucent. Add the ground chicken to the pot and break it up using a wooden spoon so that it crumbles. Cook it for another 5 minutes until the ground chicken is no longer pink. Add the oregano, chili flakes, tomato paste and stir. Add the wine and basil and cook for 3 more minutes, stirring occasionally. Finally add in the chicken broth and crushed tomatoes and season with salt and pepper as needed. Bring to a boil, turn down the heat and let simmer for 20 minutes. Prepare Cheese: In a bowl combine together the ricotta, 1 1/2 cup of the mozzarella cheese and the egg. Set aside. 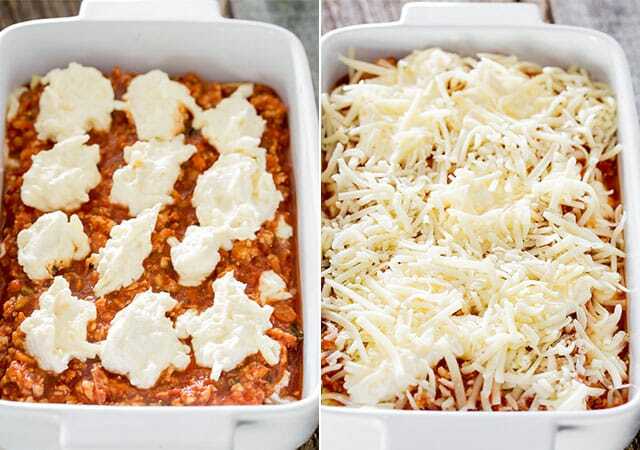 Assemble Lasagna: Spread a couple ladles of the bolognese sauce in the bottom of a ceramic 13x9 baking dish. Arrange 3 noodles over the bolognese sauce; top with a couple more ladles of the sauce, then top with 1/3 of the cheese mixture, trying to spread it around a bit. Repeat with another 3 lasagna noodles, sauce, cheese, 3 more lasagna noodles, sauce and last of the cheese. Sprinkle the remaining 1/2 cup of mozzarella cheese over the top. Bake: Bake for about an hour until the noodles are cooked through. If you're using fresh lasagna noodles, it will take less cooking time, about 35 to 45 minutes. Let the lasagna cool for a few minutes before cutting into it. Feel free to garnish it with fresh parsley or basil and Parmesan cheese. Good dry white wines to use for this recipe would be a Sauvignon Blanc, Chardonnay, or Pino Grigio. If you don't want to use wine, you can add an extra half cup of chicken broth and 2 tsp of either white wine vinegar, or regular white vinegar. You can use ground beef, pork, or turkey in this recipe instead of chicken. I’ve never been a red sauce Italian food fan but this lasagna is the best lasagna I have ever had! This lasagna became of my husband’s favorite meals. Thank you so much for the recipe. I’ve never cooked lasagna before and was a little nervous, but your instructions are so clear and easy to follow, I enjoyed the process ? That’s wonderful, so glad you guys liked it! Did you ground the chicken on your own or bought it at the meat market? I bought it ground already from my local grocery store. I made this and it came out so well! I made lasagna for the very first time and didnt cook the pasta sheets like you said, but it was perfect. We don’t get ricotta cheese or parmesan here so I used cottage and mozzarella. My only problem was, I felt like maybe cheesy richness was a bit lacking, coz i didn’t add parmesan. Do you think making some bechamel and adding in a layer of that, like sauce,bechamel, cheese-egg mix, noodle, would help? Can you suggest anything else I can do, if I use cottage instead of ricotta and do not have parmesan, to add that cheesy richness? Oh bechamel sauce would be great here, give it a try! Oh absolutely!!! That would work really well. does this need to be covered while baking if using dry noodles??? If using dry noodles I would probably cover it for the first 30 minutes at least then finish it uncovered. This looks so fantastic. I can’t wait to give it a try. This looks just so delicious!